Despite being relatively few in number, the Afghan Taliban are thriving in Afghanistan and Pakistan, as they take advantage of Islamabad's apparent ambivalence towards them, the BBC's Hugh Sykes reports from Kabul. 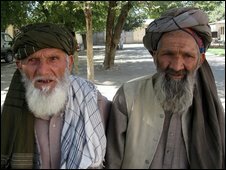 Despite their fierce reputation, Afghans are mostly gentle, thoughtful people - deeply courteous, with warm humanity that radiates from luminous eyes. They are also tolerant and very patient. There was clear evidence of barefaced election fraud, implicitly insulting people who went out to vote believing that their ballots would count. But there has been peace on the streets. One man said to me this week: "This is all so crazy I've just stopped thinking - and most of my friends are now simply depressed." Despite eight years of international assistance, many places in Kabul are a mess. 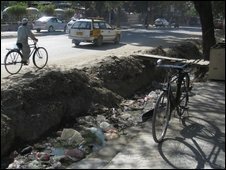 Major road intersections are pitted with pools of filthy water as wide as streams, and nearly all the deep concrete gutters by the roadside, that I have seen, are stagnant with waste water and rubbish. And all along these unhygienic streets, food vendors sell their wares from rickety wooden carts. Bananas on many carts, grapes and pomegranates on others. Almost everyone I have spoken to here on three visits in less than a year has said their demands are very simple: employment, an end to the corruption that's endemic in the Afghan system, and - security. you could beat them if you really want." There is a suspicion here that the entire Western presence is Afghanistan is deeply cynical, misguided, and fundamentally confused. The Afghan Taliban leadership and sources of supply are not even in Afghanistan, they are in Pakistan - in Quetta, a city just across the mountains from Kandahar where so many British and American troops have died. The charge of cynicism arises because the Americans and the British support the Pakistan government - and the Pakistan government at the same time provides sanctuary in Quetta for the Afghan Taliban who are killing US and British troops. It is like fighting off the enemy at the front door of your home, but leaving the back door unlocked. Or - imagine the Chicago Police in the 1920s fighting Al Capone, but turning a blind eye to the gun shops where he buys his weapons and ammunition, and even paying protection money to the owners of those shops. Haroun Mir, director of Afghanistan's Centre for Research and Policy Studies, told me he cannot understand why this surreal situation is tolerated. "Pakistan gets away with impunity. And instead of being punished, they are rewarded with US aid." "Why is American public opinion silent about this?" What the American public have been hearing on their TV networks has been Secretary of State Hillary Clinton declaring that the United States stands "shoulder to shoulder" with Pakistan. They have not heard her complaining that Pakistan provides safe haven for the Afghan Taliban who are killing American and British troops. This double-dealing has to stop, in the opinion of the independent Afghan MP - Dawood Sultanzoy. He told me that Pakistan should realise that they are creating a "boomerang effect". "The Afghan Taliban and the Pakistan Taliban are twins," he said, "and America must now get Pakistan to decide if they are an ally or an enemy." At the moment, Pakistan is both ally and enemy to the USA - ally in the fight against the Pakistani Taliban, but enemy so long as they continue to protect the Afghan Taliban. Quetta is the crucial element. An entire suburb of that Pakistani city is effectively occupied by the Afghan Taliban and their "Shura" ruling council - including their leader Mullah Omar. The Afghan Taliban get many of their basic supplies in Quetta - their motorbikes, for example, and their mobile phone SIM cards. And their supply lines cross the mountains into Afghanistan to the north. Afghanistan is caught in the middle. Nothing will really change here until this has been resolved. Pakistan could deny the Afghan Taliban their safe haven in Quetta just across the border from where British and American troops and Afghan civilians are being killed. The question here in Afghanistan is - why don't they? One answer is that Pakistan has to hedge its bets. As more and more British and American troops die, pressure from the public in Britain and America to withdraw their forces could become irresistible. They are already waiting in the wings. On Friday, Nato-led International Security Assistance Force (Isaf) troops from Poland went to a village in Ghazni province south of Kabul. They distributed blankets, and some radios, and they left. Twenty minutes later, a dozen Taliban arrived on motorcycles and seized the blankets; they set fire to some of them, and took the rest away for themselves. The Afghan Taliban are well-organised, well-resourced, patient - and they have good sources of intelligence. They should not be under-estimated. Pakistan needs smooth relations with whoever is in power in Kabul. Islamabad was one of the very few capitals where the previous Afghan Taliban regime had an embassy. Only two other countries recognised the Taliban government - Saudi Arabia and the United Arab Emirates. And after 11 September 2001, the only nation that continued to recognise the Taliban government in Kabul was...Pakistan.